Olivia Cleans Green: WIWW: Yellow, How are You? How are you? I've been feeling really optimistic this past week (I'll explain why in a future post) but tonight I'm just feeling "meh." 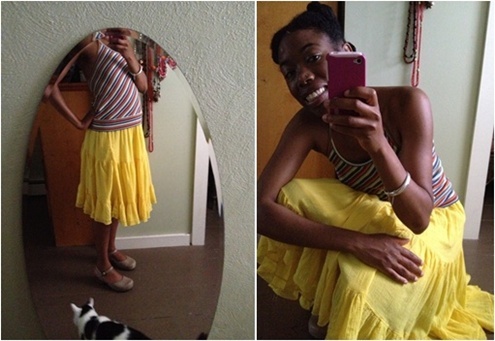 One thing I like to do to lift my spirits is change into something bright and airy, like this skirt. Making sure I make all the iPhone photo cliches: selfie (check) & cat photobomb (check)! Does wearing bright clothing help improve your mood? Do you have any "get happy" outfits? Oh, I so have "get happy" outfits--the kitty ears outfit was one of them! :P You look really good in yellow! the kitty ears outfit brings joy to everyone! i like your "get happy" outfit and have a similar skirt in turquoise. i think what we put on can affect our mood...especially when we rock something that makes us feel so fly!! ps//thanks for the compliment...maybe my workouts are paying off! Thanks Chandra. Ooo, I would love to have a skirt like this in turquoise! And yeah, have you blogged about your work out regimen? Inquiring minds want to know :-) Although I did 5 sets of stairs at the park then ran home (it's just 5 blocks) and nearly saw stars today. I'm sure I've gotta work my way up to whatever you're doing. Your abs are an inspiration though!